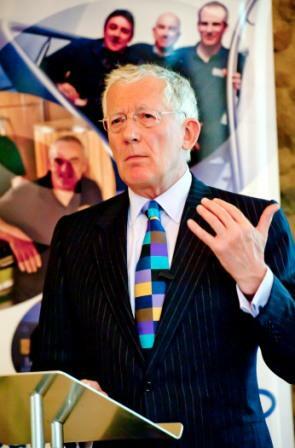 Following his keynote speeches at a series of special events for progressive local businesses in Cornwall, Devon and Somerset, Nick Hewer has praised the curiosity and enthusiasm of the invited audiences. The right hand man to Lord Alan Sugar, Nick Hewer is well known for his role in The Apprentice television programme and was one of three speakers at the Focus for Growth events organised by Business Link at Trelissick Garden near Truro, Sandy Park in Exeter and Monks Yard in Ilminster. “It has been a very rewarding and encouraging visit to the south west,” said Hewer. “All three events were very well attended and I was really struck by the tremendous sense of optimism and open-mindedness from the business managers and owners who came along to each of the events. This week’s ‘Focus for Growth’ events were part of a series of initiatives being developed by Business Link’s Growth service to help local businesses move on to the next stage of development. Alongside Nick Hewer, the events also featured Gavin Eddy, owner of Forward Space, while Cornish entrepreneuer, David Marsh of QT Services, joined the panel of speakers at Trelissick Garden.